Pittsfield — The Four Freedoms Coalition, Greylock Together, Indivisible Pittsfield and the Berkshire Democratic Brigades invite community members to join a nationwide protest Thursday, April 4, from noon to 1 p.m. in Park Square to call on Attorney General William Barr and elected officials to take decisive steps to make the findings of the Mueller investigation public. The investigation’s final report was released to Barr March 22. 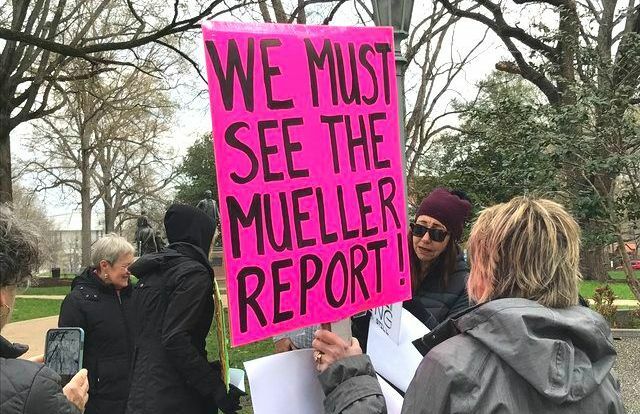 Nine in 10 Americans want Mueller’s report to be public, including 80 percent in Trump’s own party, according to a CNN poll released March 20. Protests will take place in hundreds of cities and towns and are being organized by a coalition of dozens of public interest organizations. More information can be found at http://www.trumpisnotabovethelaw.org. All are welcome to attend. Pittsfield law prohibits signs mounted on sticks. For more information, contact the Four Freedoms Coalition at 4freedomscoalition@gmail.com. Fools are never happy, especially if they don’t like the results. According to a CNN poll…well that answers it all. Isn’t noon to one normally core working hours? another bunch of people with nothing better to do!! !